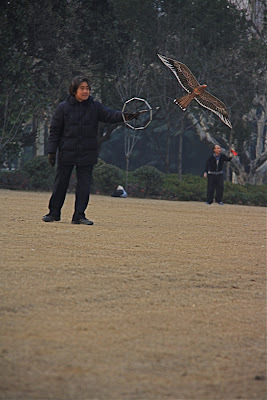 Kite flying is a very popular past-time all over China, and especially so in Fuxing Park. This is not a hobby for mere kids, however, and those under 50 should practice elsewhere. Space on the big square grass lawn is hotly contested and turf wars play out constantly between the fighter kite guys, the bird kite guys and the air cell kite guys. Don't even try turning up with your Hello Kitty kite. 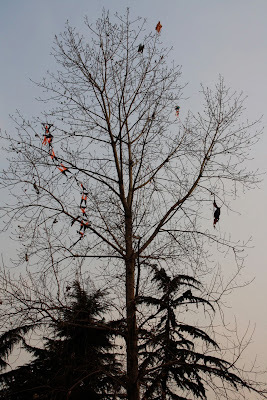 If the wind drops out suddenly though, all bets are off because all types of kites can end up in the giant kite graveyard tree at the southern end of the park. Try and get your torn and mangled kite out of this one, and you might end up with a hip replacement you weren't banking on.